Yampa River State Park rangers Matt Schuler, left, and Jacob Dewhirst, middle, prepare to launch a boat Friday with Park Manager Ron Dellacroce in an effort to save two mule deer fawns trapped in the ice at Elkhead Reservoir. The joint Bureau of Land Management, Colorado State Parks rescue effort was a success. — Ed Hendricks, law enforcement ranger with the Bureau of Land Management’s Little Snake Field Office, about a multi-agency effort to save two fawns from Elkhead Reservoir. It’s not uncommon to hear stories about multiple agencies collaborating together on a case to serve the public good. But too often those tales are told in reference to crimes, fires or a natural disaster. 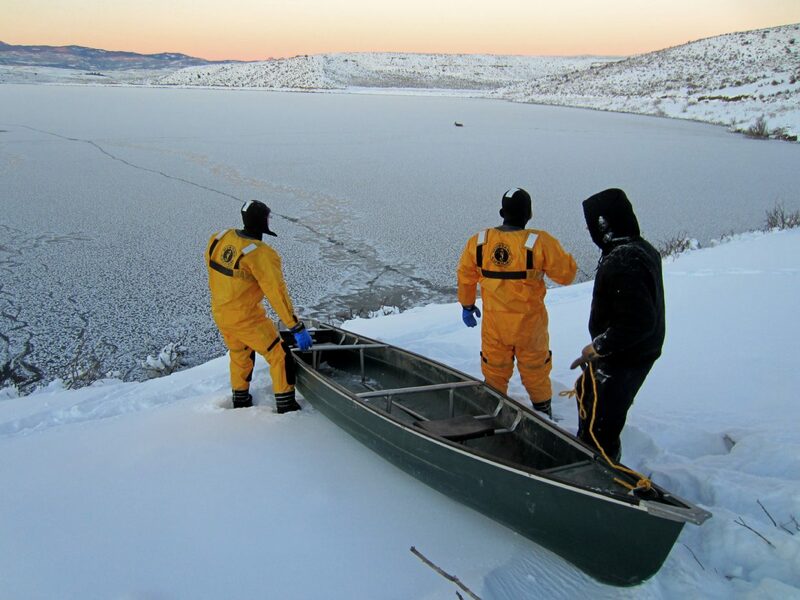 Last week rangers from two local agencies came together to pull off a daring rescue to save a pair of mule deer fawns trapped in the ice at Elkhead Reservoir. Operation rescue fawn began at about 4 p.m. Friday when Hendricks was flagged down by a concerned resident while on patrol near Elkhead Reservoir. After taking an initial report Hendricks located the two fawns stuck in the ice about 200 feet away from shore, east of the dam. Hendricks also located the mother on shore not far from where her fawns were trapped, but she was spent and distraught from what appeared to be her own struggle to escape the ice, Hendricks said. Hendricks radioed officials at the Yampa River State Park/Elkhead Reservoir office in Hayden for assistance. Ron Dellacroce, park manager, and park rangers Matt Schuler and Jacob Dewhirst responded to the scene with rope and a boat. Schuler and Dewhirst outfitted themselves in ice rescue suits and made their way out onto the frozen water despite Hendricks’ observations that Elkhead was not yet frozen the day before and the ice couldn’t be more than a quarter to a half-inch thick. Schuler and Dewhirst arrived at the first fawn to find her stomach was frozen to the ice, due to her warm body and the length of time she must have been trapped, Hendricks said. But rangers were able to free the fawn and rescuers onshore were able to pull her to safety. Once the first fawn was out of danger rescuers redeployed down the shoreline to make a rescue attempt on the second. Darkness was beginning to set in as Schuler and Dewhirst traversed across Elkhead, Hendricks said, and, as with the first fawn, the second rescue attempt posed its own unique set of challenges. As rangers slowly closed in on the second fawn rescuers realized the rope was about 20 feet short. With light dissipating and temperatures dropping there was not enough time to restart the rescue attempt, Hendricks said. Rescuers on the banks anchored themselves to the shoreline, formed a human chain and stepped out onto the frozen reservoir to maximize their reach, Hendricks said. Schuler and Dewhirst did the same, and were just barely able to reach the stranded fawn. After some struggling the fawn was freed and all were pulled back safely to the shoreline.